New Technology Skills of the emerging knowledge based economy, specifically in select areas such as Modern Appliances Maintenance, Biotechnology, ICT Skills, Energy and Environment, have been able to provide enviable opportunities for employment and career growth, at the bottom of the pyramid. However, in the many backward regions of our country, these informal, flexible, market based, competency focused, Vocational Education and Training (VET) Systems, are yet to make their impact on the livelihood plans of unemployed youth. The marginalized and vulnerable sections and more particularly the adolescents and youth of this section are severely disadvantaged for acquiring these skills for reaping the opportunities offered by the new knowledge economy. These youth deserve a better, new technology skills recovery passage, to jumpstart their career paths, into new growth trajectories, into the future. Novel mechanisms for redesigning, adapting and implementing these New Technology based training systems, have to be developed and continuously updated to keep pace with technological changes sweeping these sectors, so as to accelerate the shift of marginal and vulnerable youth towards more productive and remunerative, new technology based career options. TREC-STEP firmly believes that the new emerging technology skills can leverage bottom 20% of the society, living in less than $1 or 2 per day, to top 20% of the population, earning $10 or more per day. The present NET Skills Project funded by the European Commission and the DST is aiming at these notable objectives and has provided a great opportunity for TREC-STEP and its partners to re-engage and deploy their efforts to realize their development dreams for the benefit of our society. 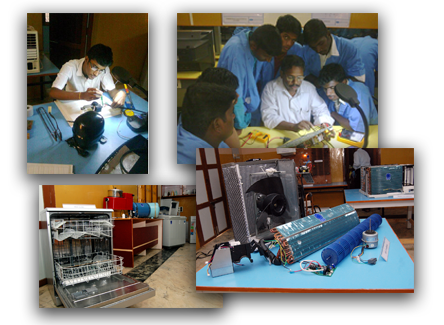 The Project, 'Incubating New Emerging Technology (NET) Skills by creating sustainable models of NET Skills packages', is funded by the European Union (EU) through the European Commission, under the support to Civil Society Organizations in Development, for in-country interventions in Vocational Education and Training for vulnerable and marginalized groups in India. This Project is also supported by the Department of Science & Technology (DST), Government of India. The Project aims to bridge this yawning gap in the development front, by focusing on bringing ashore New Emerging Technology Skills, for the benefit of the youth and adolescents of the backward regions in our country. Tiruchirappalli Regional Engineering College Science & Technology Entrepreneurs Park (TREC-STEP), Tiruchirappalli. Vivekananda Institute of Bio-technology (VIB), Nimpith, West Bengal. Science & Technology Park (STP),Pune, Maharastra. It is to be noted here that these unique NETS curriculum packages, emerging from the growth of the knowledge economy, are currently not available anywhere in the country, making it a very compelling model for inclusion and replication, nation wide. The aspiring young ‘technicians of the future’, armed with these new technology skills and gaining new job opportunities, are not only a great connect for future growth of the regions, into prosperity, but also a great source of an inspiration for others from the most vulnerable and marginalized sections, to follow. This Project shall be a pacesetter for accelerating efforts to alleviate the unacceptable conditions of isolation and under development, etc. in parts of our country, creating an enabling cycle of connectivity, growth and development, by providing a new technology skill led human resource development model, for the youth from the backward regions.